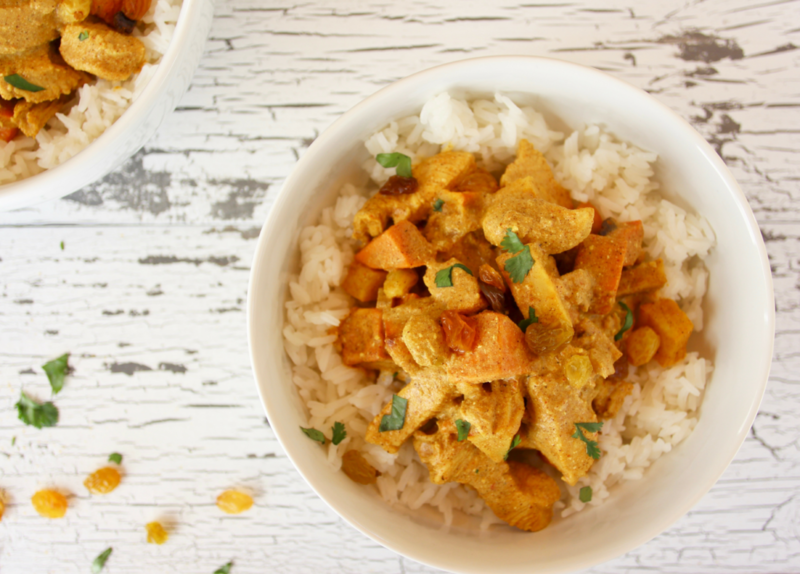 For those who don’t know, Indian cuisine is my absolute favorite, and if I were to have one signature dish, my Indian chicken curry recipe would probably be it. For years, I’ve kept this recipe completely under wraps. But since we’ve had such an overwhelming response to our Thai Yellow Curry with Chicken post (and because I love you all), I decided that the time is now. It’s time to share my top-secret, mouth-wateringly delicious Indian chicken curry recipe. And I’m kind of (really) excited about it. So if you can handle a big kick of heat, paired with creamy coconut goodness, intermittent bursts of sweetness, and tender bites of chicken and veggies, then I promise you’ll love this recipe! I cannot wait for you guys to try my Indian chicken curry recipe for yourselves, so let’s get started. But actually, hold on. I need to talk about this curry for just one more second. Okay? Because, at this point, I’m not sure I’ve done it enough justice. First and foremost, this curry is ridiculously delicious. And yeah, I know I said that already. But it’s the most important part, so it’s worth repeating. This curry is also spicy, rich and creamy, sweet, and packed with vegetables, chicken, and layers upon layers of Indian flavors. 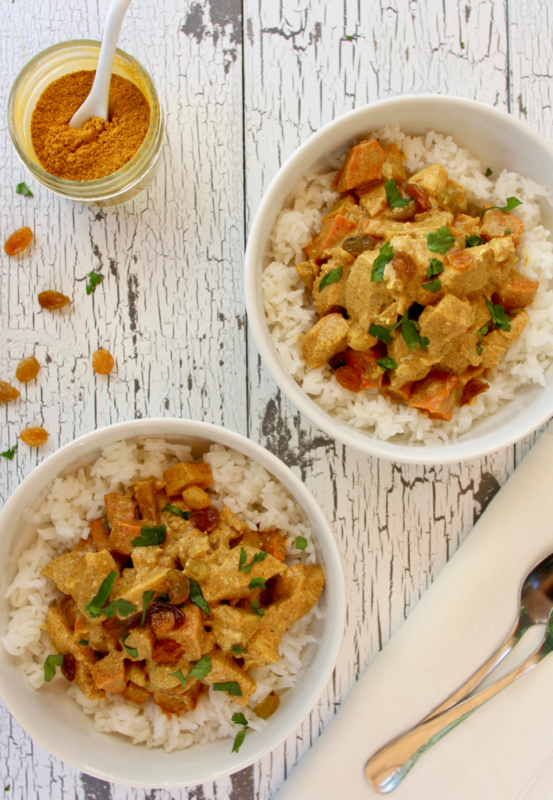 Another huge plus is that this Indian chicken curry recipe calls for ingredients that you (mostly) have on hand already (or can easily find in the store). Just to name a few of the main components, you’ll need chicken, carrots, sweet potatoes, yams, an onion, a lemon, and plain yogurt. This curry is also very easy to make, so long as you have a bit of patience and love to commit to it! Warning: this curry causes extreme amounts of happiness and excessive mutterings of the word yum. I think you can handle it, though. When I make this Indian chicken curry recipe, I make a giant batch. Everyone loves this stuff, so making enough curry to feed only a few people, just once, is never acceptable. In reality, this is the kind of meal that’s so damn good, you want to eat it today, tomorrow, and maybe even the next day, too. You also want to freeze a portion or two, so that you can eat it whenever a craving comes on. Plus, making this curry is more time-intensive than other dishes, so it makes sense to cook up a giant batch! For all those reasons, this recipe fills up my big 6-quart Dutch oven almost to the brim with delicious curry. But if you, for some (crazy) reason, want to make less curry (why would you ever want to make less curry?! ), then you can simply use half the amount of each ingredient listed in the recipe. Just remember this moment, right now, in which I’m telling you that you’ll regret not having more curry to enjoy later! Now, let’s talk about some of the other ingredients you’ll need for this Indian chicken curry recipe. Less common items you may not already have in your pantry (and that you may have difficulty finding in your local store) include Indian curry powder, coconut milk, and organic extra virgin coconut oil. I recommend this Indian curry powder, because it’s bursting with flavor and contains a larger variety of spices than many other curries do. It’s also not super hot, which means you can tailor your curry’s heat level to your liking by adding more and more cayenne pepper. I’ve also tested out plenty of coconut milk for this recipe, but this coconut milk is my favorite. It’s so creamy and gives the curry a great — but not overpowering — coconut flavor. The same goes for this coconut oil. I will also quickly mention that there’s a fair amount of prep necessary to make this curry. Chopping the onions, sweet potatoes, carrots, yams, and chicken takes up a large chunk of time, as does grating your fresh ginger, mincing your garlic, and getting all of your other spices and ingredients out, measured, and ready to throw into your Dutch oven. But I promise, once the prep is complete, making this Indian chicken curry recipe couldn’t be simpler. I also promise that any time and effort spent making this curry will be repaid a hundredfold in scrumptious flavors and the satisfaction of knowing that you just made one ginormous, awesome pot of Indian curry for you, your friends, and family. Feeling inspired to make some Indian chicken curry? 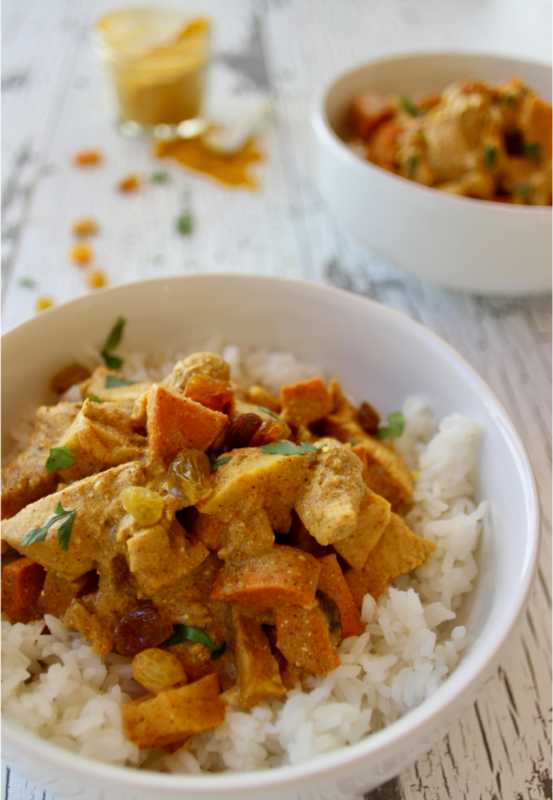 I know you, your friends, and family will absolutely love my Indian chicken curry recipe, so what are you waiting for? Grab some Indian curry powder and heat up that Dutch oven. It’s time to cook up a spicy pot of goodness and nurture your love for Indian cuisine. 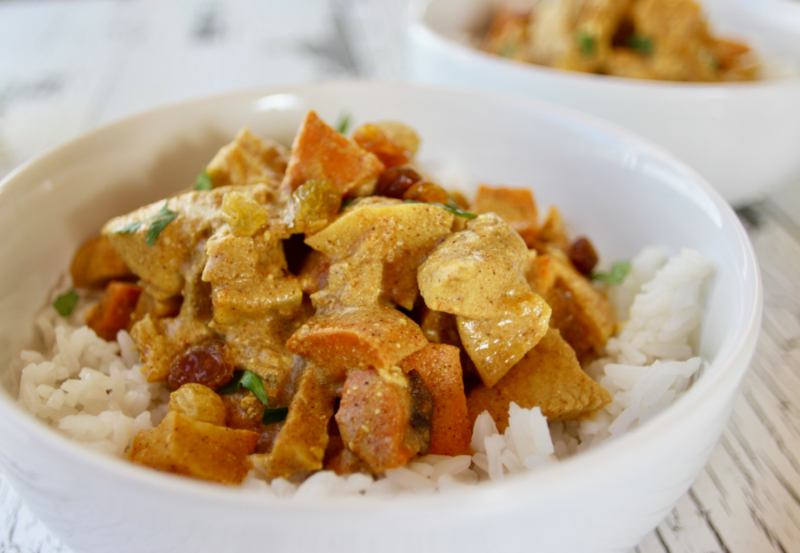 This Indian chicken curry recipe is spicy and creamy, with bursts of sweetness from golden raisins, sweet potatoes, and carrots. It's my very own version of delicious curry, adapted from a recipe from India. This curry is best served over rice with some freshly baked naan! Preheat your oven(s) to 400 degrees. Spread yams, sweet potatoes, and carrots into one layer, across multiple sheet pans, making sure not to crowd the vegetables. Season the yams, sweet potatoes, and carrots with sprinklings of salt, pepper, paprika, cinnamon, cayenne pepper, and olive oil. Toss together to lightly coat. Bake until crispy and almost fork tender. Set aside. In a pot or Dutch oven, heat coconut oil. Add in onions and sauté until translucent. Stir constantly to avoid burning. Add in yellow curry powder, paprika, cinnamon, cayenne pepper, ginger, salt, bay leaves, and garlic. Continue stirring for two minutes. Add in tomato paste, yogurt, coconut milk, and chicken broth, and bring to a boil. Once boiling, add in the chicken pieces, reduce heat to low, and simmer for 15 minutes. Remove bay leaves. Stir in lemon juice, sugar, golden raisins, and more salt to taste. If desired, add more cayenne pepper to taste. Simmer for 5 more minutes. Stir in yams, sweet potatoes, and carrots. Spoon over basmati or jasmine rice, and serve with fresh naan. If desired, garnish with cilantro and more golden raisins. I recommend getting out, prepping, and measuring all of your ingredients before ever turning on the stove. There are a lot of components, and if you're not well prepped, making this curry can get a little hectic! You can substitute unrefined virgin coconut oil for olive oil. For a less spicy curry, use less cayenne pepper. This curry is so good that you'll want leftovers, either to eat throughout the week, or to freeze for later. For that reason, this recipe makes one giant pot of curry, enough to feed 10-12 hungry people! However, if you, for some reason, want to make less curry, simply use half the amount of every ingredient listed above. Did you make my Indian chicken curry recipe? Rate the recipe and tell us how it went, in the comments section below. Did you post photos of your curry? Make sure to tag them with @travelalphas and #travelalphas so we can see!